Eva Mae Tomlinson passed into eternal rest on August 23, 2018 at the age of 86. She was born in Slater, FL to parents, John V. and Eva Sessions. She met and married the love of her life, Austin Tomlinson in 1949. In 1954, they moved to Fort Myers from Copeland, FL and raised a family. Austin and Eva were active in the Salvation Army, as well as Crossroads Baptist Church in Fort Myers, FL. 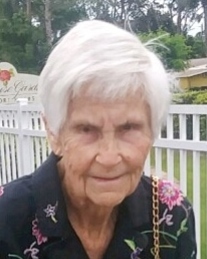 Eva will be dearly missed by her two sons, Austin Douglas (wife Janice) and Brian Keith Tomlinson; four grandchildren, Justin, Jake, Rachelle Johnson and Sarah Tomlinson; and five great grandchildren. Visitation hours will be held on Tuesday August 28, 2018 from 6PM until 8PM at Harvey-Engelhardt Funeral Home in Fort Myers. A funeral service will take place at 11AM Wednesday August 29, 2018 at the Salvation Army Chapel on McGregor Boulevard in Fort Myers, followed by interment in Fort Myers Memorial Gardens Cemetery. Please visit www.harvey-engelhardt.com to share a condolence.